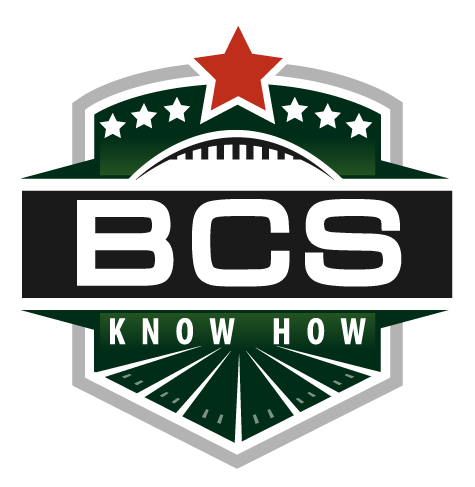 As it has in every college football season under the reign of the BCS, a team’s computer ranking is its most confusing and debate-causing aspect of the entire Bowl Championship Series process. Which team has accomplished the most when the numbers are all you can see? It’s hard for a sport that includes so much subjectivity to remove the fan/expectation/showmanship aspect from the game and look at only the data. That’s why here at BCS Know How for the last three years we’ve put together the implication worksheet. Which teams have accomplished the most according to the computers? And what teams still have the opportunity to accomplish more? So what can you find here? The top eight BCS teams (or smaller, if the “striking distance” shrinks), along with their record and strength of schedule, according to Sagarin. The real important stats, however, come after that. Each team is listed with key games already played, and key games to come. Key games are any against the BCS top 25 or the Sagarin PURE_ELO top 60. If teams are unlisted in the BCS, they are listed with their Sagarin rank, and all SOS is Sagarin-based. Games for the upcoming weekend are bolded. Note: All teams are included in the Sagarin data, including bowl-ineligible and FCS teams. If they count there, they count here. The BCS throws out any FCS or ineligible team when calculating its final tally. This entry was posted in Weekly Update and tagged alabama crimson tide, bcs implications, BCS Rankings, featured, florida state seminoles, Jeff Sagarin, oregon ducks, preview, remaining opponents, strength of schedule, week 10. Bookmark the permalink.